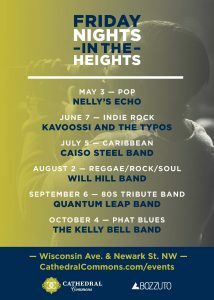 The 2019 Friday Nights in the Heights concert series at Cathedral Commons kicks off on May 3rd! Join us on Newark Street and Wisconsin Ave. for live music, local food & drink, and fun for the whole family. Friday Nights in the Heights concerts will be held the first Friday of every month May-October. This years concert series is sponsored by Silver.